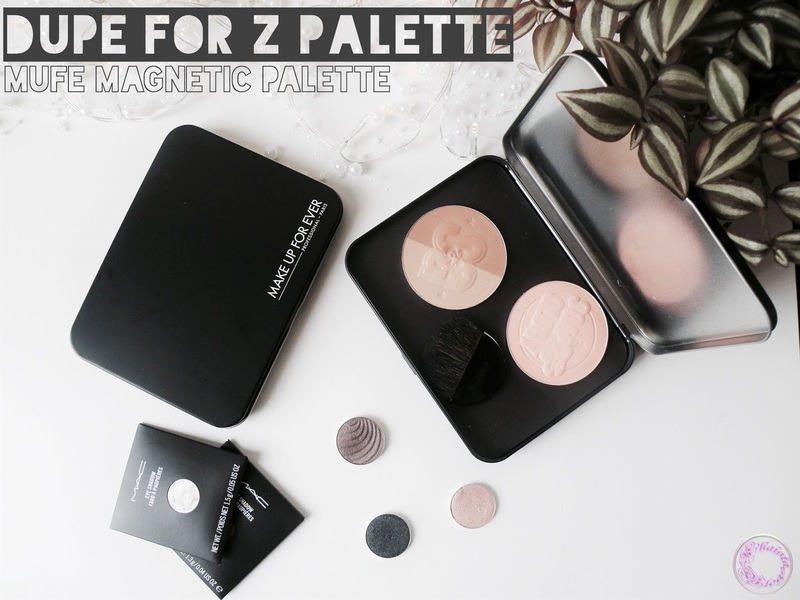 Makeup forever magnetic palette is a good dupe for Z palette and it is a lot cheaper than that in price but much better in performance. MUFE magnetic palette comes in four different sizes; small, medium, large and extra-large. I got it in size medium from Debenhams which retails for £6. The casing is made of tin, not from cardboard material like many others. The tin material is also not thin but very sturdy and heavy duty. Magnet strip is attached to foam and placed at the base of the palette. It can be easily removed it you want. And as the palette is made of tin, any magnetised pan can attach to it. The magnetic palette itself is enough deep to hold any size of pan. Lid of the palette is not flat but has some height which provides extra space for storing any product even dome shaped products too like baked blushes. Makeup forever medium size magnetic palette can hold 20 MUG or MAC eyeshadows and 12 MUFE artist shadows without inserts. Artist shadows are a lot bigger in size than MAC and MUG. For comparison you can see in the photo down below the size difference. The only down side of this palette is that there is no way to tell which palette contains what product. Because there is no clear window to look into the palette. But that doesn’t bother me as I don’t have many de-potted products at this moment and I can label at the back of palette for my convenience. 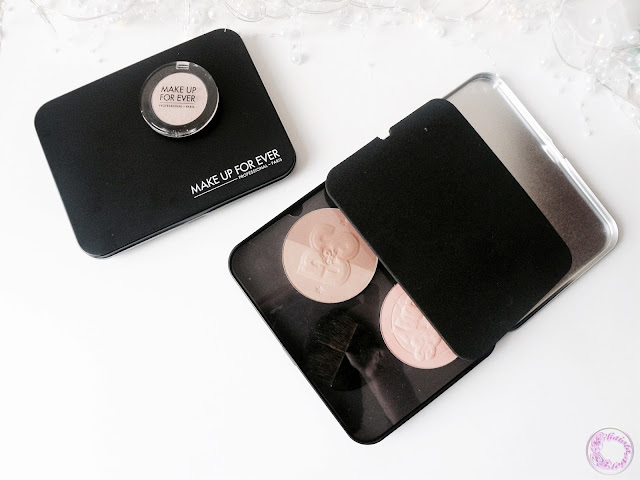 MUFE palette comes with a thick transparent plastic sheet and black dense sponge. I don’t know what’s the real purpose of these as there are not instructions. However, I am assuming if I travel with these palettes, I can cover the products with sheet and then secure them with the sponge for extra cushioning and to stop products from shattering if broken. I de-potted some of my Soap&Glory products and they don’t have magnetise pan. So I bought a self-adhesive magnetic tape from amazon which cost me £ 1.09 to use underneath these pans. 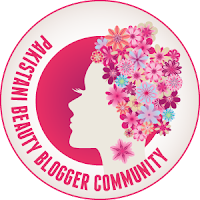 Just for a little fun, let me give you a rundown of all the magnetic palettes available at the moment and do some comparison. 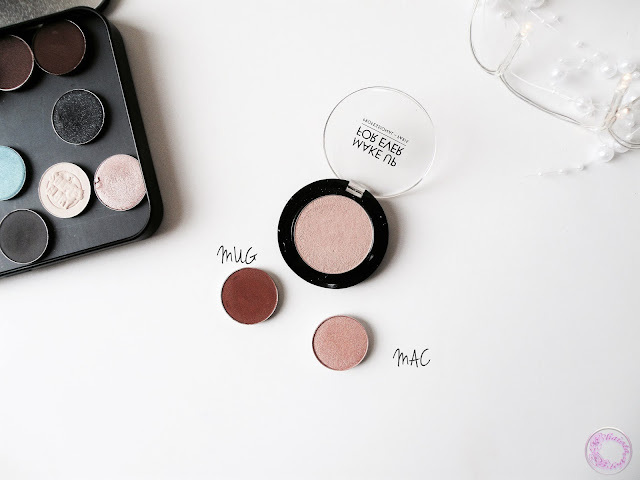 MUFE medium magnetic palette can holds 20 MAC or MUG eyeshadows and retails for £6. It is a matte black solid tin palette. It doesn’t have any mirror inside the casing or transparent lid. Z palette in medium size, holds up to 15 MUG eyeshadow pans and retails for £ 14.95. Z palette is made of recycle material, have transparent lid and is decorated with nice prints. My kit co magnetic palette is available in one size and can hold 18 MAC eyeshadows. It retail price is £11.50. but it comes with extra12 stickers and magnetic disks. It is a black cardboard palette with a transparent lid. 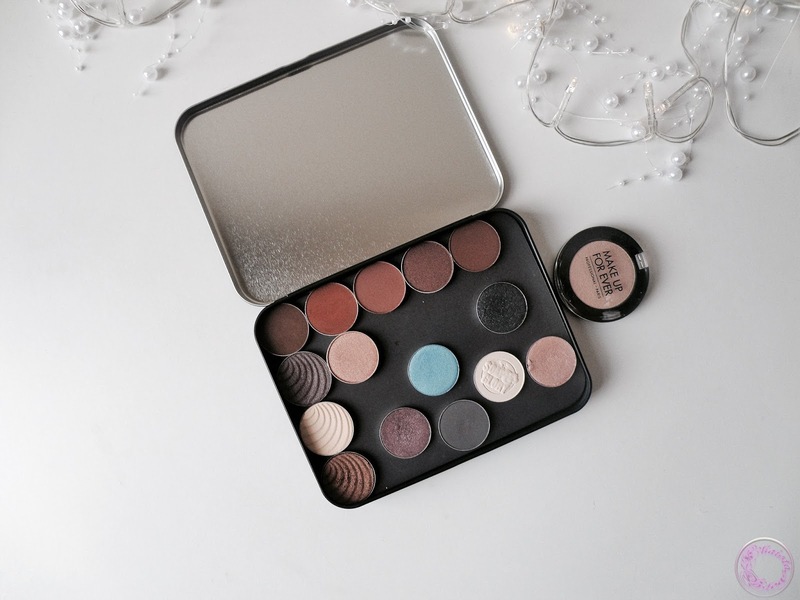 Other option is FREEDOM makeup London pro artist pro HD magnetic palette which can fits 18 FREEDOM eyeshadows or 8 contour or blushes pans and it costs £5. It has big mirror as well. Again it is made of a cardboard material. ArtBin various slim line Magnetic needle casing is an odd choice but it can be used as an eyeshadow holder. It retails for £7.99 at Amazon. I don’t know how many pans can it accommodate but worth the shot. All the links to the above mentioned products are below for your convenience. I hope you have enjoyed my post. Kindly leave your comments and suggestions below. And if you are aware of any other palettes then do share. This is definitely a useful palette and the price is so reasonable. Thanks for sharing. I love the colours in this palette. Pinks are some of my favourite shades!